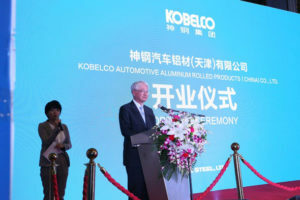 Kobe Steel announced this week that thousands of tons of metals shipped to OEMs since last year potentially were improperly represented as meeting specifications. About 2,200 tons of copper tubes and strips also might have been incorrectly declared to meet quality standards. “This incident of improper conduct came to light following self-inspections and emergency quality audits of the compliance status of contracts executed as to products shipped over the past year,” Kobe Steel wrote Sunday. However, Bloomberg Markets reported that Kobe Steel had later in the week said the misrepresentations at aluminum plants were systemic and might have dated back 10 years for some aluminum items. The Financial Times reported Wednesday that Kobe Steel had added steel powder, used in parts like gears, to the lineup of questionable materials supplied. Bloomberg Markets suggested that several OEMs might have been affected, including Ford, General Motors, Honda, Subaru, Nissan, Mitsubishi, Suzuki and Toyota. Bloomberg Markets reported that Toyota said it found Kobe Steel materials with allegedly faked data on what the news service characterized as “hoods, doors and peripheral areas,” and Honda had used such content in hoods and doors. Subaru, Nissan, Mazda, Honda and GM have confirmed to Repairer Driven News that they’re investigating materials supplied by Kobe Steel. A Subaru spokesman wrote that they were investigating the issue and more details would be available later. Suzuki, which used to sell cars in the U.S. during the time period Bloomberg Markets reported, confirmed that none of its cars had Kobe Steel aluminum or copper, but it was checking on its motorcycles. Continue to check Repairer Driven News for updates. For body shops and mechanics, there might be little to do except monitor the situation and educate customers that a recall could be possible, particularly on exterior panels and closures. The issue also lends weight to auto recyclers’ push for a means of part-specific, rather than vehicle-specific, recall tracking.